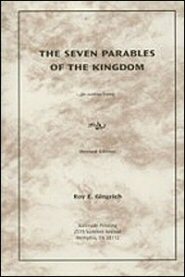 This outline commentary on The Seven Parables of the Kingdom adds another volume to the library of books that he has written over the years. His books reflect his dedication to Bible study and his desire to minister to both sinners and saints and they have been used of God to bless many who hunger and thirst for a deeper knowledge of God’s Word. The reader of this book will find its contents to be both interesting and helpful. Brother Gingrich, in dealing with the seven parables found in Matthew thirteen, has given us the background to these parables, an explanatory outline of these parables, and the lessons to us from these parables. He helps us to understand the program and the work of God during the period between the two advents of Christ, and he, from the teachings of these parables, gives us reasons for faithfully preserving in our labors for God in spite of the sometimes disappointing results of our ministry and our chronic tendency to throw up our hands in despair.